Computers—like human beings—can be abused. In some of the stories in this unique collection, computers have a self-willed life of their own; in others they are ill used and made to commit crimes and other acts of skulduggery which are often chilling and sometimes amusing. These stories have been written by acknowledged masters of suspense, intrigue, and the bizarre: writers whose imaginations have been fuelled by the possibilities inherent in the new technology. Whether you’re a crime buff or a computer fancier, a science fiction fan or just someone who loves a good read, you’ll find plenty of diversion in this interesting and varied collection of stories assembled by the world’s most respected anthologists. Stories by Robert Silverberg, Joe Gores, Edward Wellen, Edward Hoch, Gordon R. Dickson, Stan Dryer, J.T. McIntosh, Poul Anderson, and Isaac Asimov. Introduction by Isaac Asimov. 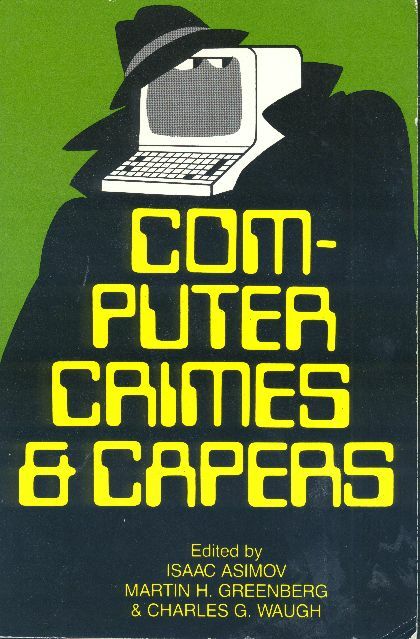 This anthology about computers and crime is surprisingly disappointing, for all that it includes “All the Troubles of the World” and Gordon R. Dickson’s very funny “Computers Don’t Argue.” I don’t particularly care for any of the other stories, however, and Edward Wellen’s “Goldbrick” in particular is very long (76 pages) and a story which I don’t enjoy in the slightest. Its presence more than offsets the inclusion of “Computers Don’t Argue” and “All the Troubles of the World.” This is definitely a volume to pass on.